This is a morning ritual, playing around with nuts and seeds and mostly being creative… Try and experiment by adding dried fruits, like cranberries, goji berries or fresh berries. My favorite way to serve is with coconut or almond milk. Fresh Greek yogurt with a drizzle of honey and fresh berries, delicious too…! 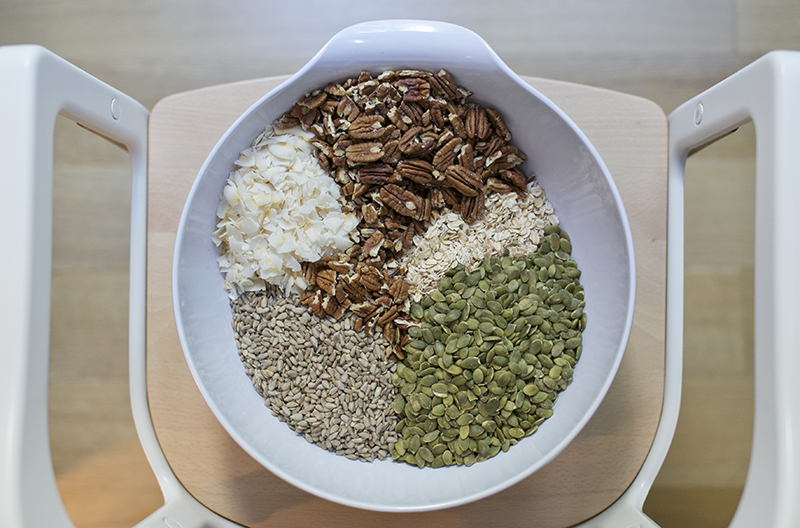 I make a bunch of granola every 2-3 weeks and add whatever seeds, nuts and dried fruit I have in my pantry. 1. Preheat the oven to 150°C (300°F). Place old-fashioned, rolled oats, pumpkin seeds, sunflower seeds, pecans, almonds, syrup, olive oil, sugar, and salt in a large bowl and mix with a wooden spoon to combine. Leave out the coconut flakes. 2. Line a rimmed baking tin with parchment paper and in a single, even layer, spread out the granola mixture. 3. 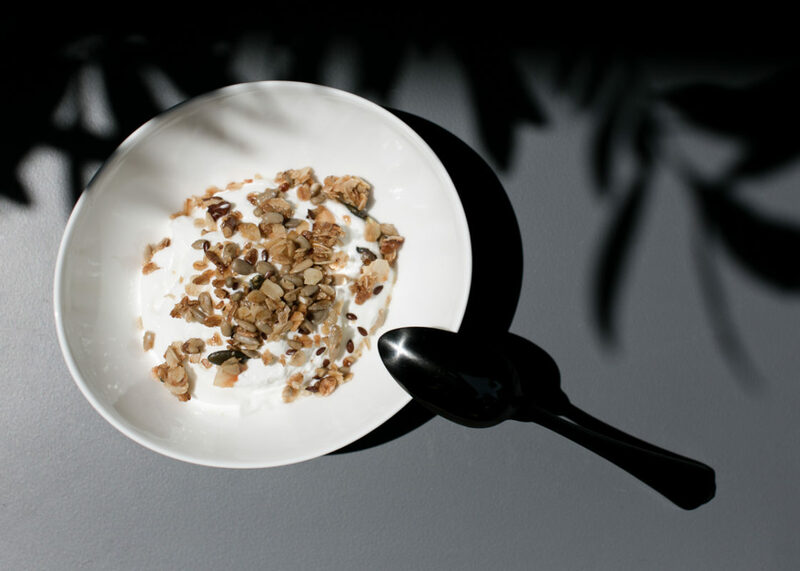 Bake in the preheated oven, stirring every 10 to 15 minutes, until granola is toasted, for about 40 to 45 minutes. After the first 15 minutes add the coconut flakes. 4. Remove the granola from the oven and let it cool completely before serving. 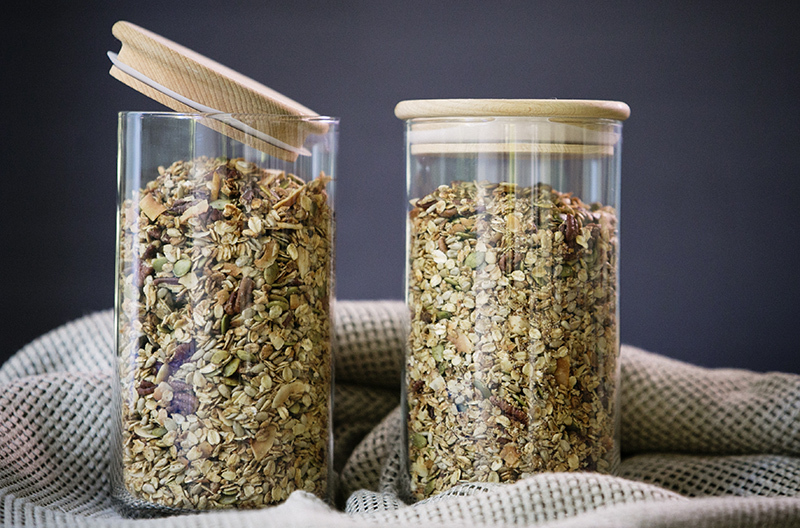 Homemade granola can be stored in an airtight container and is to be consumed within 1 month. Keeping the oven heated to 150°C (300°F) and giving the mixture a good stir every 10 minutes are both important so that the unpleasant taste of “burnt” seeds doesn’t occur. Use your imagination and substitute pecan nuts with walnuts, maple syrup with agave syrup or pure honey; add wheat germ, flax seeds, and sesame seeds. After it is baked, you can add dried fruits such as cranberries or dried cherries.